Visit Benbulben on Ireland’s Wild Atlantic – Get Away – Eat. Stay. Play. 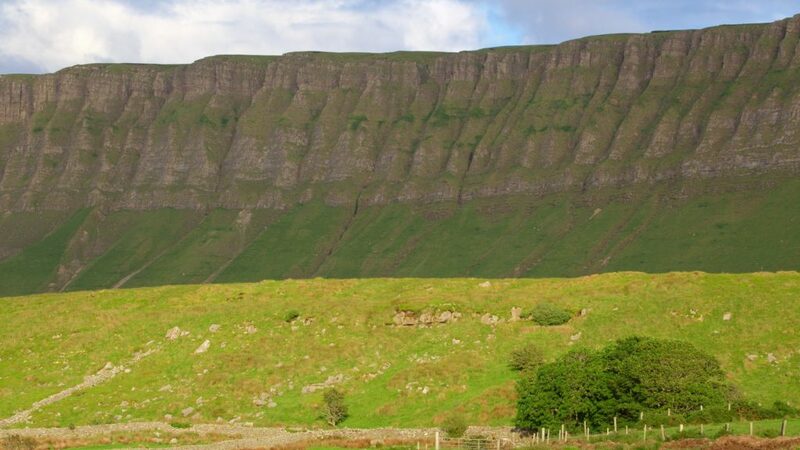 Benbulben is known as County Sligo’s ‘Table Mountain’ and is part of the Dartry Mountains. Benbulben was formed as a result of the different responses to erosion of the limestone and shale of which the mountain is formed. A hard and resistant limestone forms the upper cliffs and precipices. Benbulben was formed during the Ice age, when large parts of the earth were under glaciers. It was originally merely a large ridge, however the moving glaciers cut into the earth, leaving a distinct formation, now called Benbulben. The steeper sides of Benbulben are composed of large amounts of Dartry limestone on top of smaller amounts of Glencar limestone. The smoother sides are composed of Benbulben shale. These rocks formed in the area approximately 320 million years ago. Barytes was mined at Glencarbury on the Benbulben range between 1894 and 1979. Benbulben hosts a unique variety of plants, possessing some organisms found nowhere else in Ireland. Many are artic alpine plants, due to the mountain’s height, which allows for cooler temperatures than is normal. These plants were deposited when the glaciers that created Benbulben melted. Insects, hares and foxes inhabit Benbulben. It is not recommended to climb Benbulben as there is no official trail, there is a looped walk around Benbulben and Sligo Tourism Office can give you details of this. Benbulbin is an established walking destination. If climbed by the north face, it is a dangerous climb. That side bears the brunt of the high winds and storms that come in from the Atlantic Ocean. However, if approached by the south side, it is an easy walk, since that side slopes very gently. Upon reaching the summit, the climber is rewarded with a magnificent view over the coastal plain of north County Sligo and the Atlantic ocean. The land adjacent to the impressive western edge of the ridge is privately owned farmland and not accessible to the general public. However, there is a paved path up the south face to the east near Glencar Waterfall just over the County Leitrim border. One of the most beautiful trails running alongside Benbulben mountain is the Gortarowey looped walk. It runs both through the forest and out in the open overlooking the magnificent views of Benbulben and the bay of Donegal. It is 4km in length and would take approximately 1.5 hours to walk and is suitable for all ages. Benbulbin hosts a unique variety of plants, including some organisms found nowhere else in Ireland. Many are Arctic–alpine plants, due to the mountain’s height, which allows for cooler temperatures than is normal. These plants were deposited when the glaciers that created Benbulbin melted. Wild hares and foxes inhabit Benbulbin. In 2012, research revealed that the Fringed Sandwort had survived the Ice Age and is perhaps 100,000 years old. In Ireland the plant is unique to Benbulbin. The discovery calls into question the prior consensus that Ireland’s flora and fauna date from or after the end of the Ice Age.